The B-Folders secure organizer will not only allow you to migrate your MemoPad memos, Contacts and Tasks from your BlackBerry, but will also upgrade your configuration with tight security measures and allow you to use it on today’s smartphones, tablets, laptops, and desktops. A lot of BlackBerry users, desperate to save years of data saved on the BlackBerry operating system, are trying unsuccessfully to sync different pieces of software (Outlook, Google contacts/tasks, and variety of Android apps), encountering endless and unsolvable compatibility issues. History certainly demonstrates that syncing data between different software programs never works flawlessly. B-Folders has desktop editions for Windows, Mac, and Linux, as well as an Android edition for smartphones and tablets. This offers total data compatibility across the different platforms and devices. We are also continuing to develop support for additional platforms. Today there are real threats to your privacy - losing your laptop or smartphone, computer theft, malware, financial identity theft, etc. B-Folders offers a level of security for your sensitive data beyond traditional measures (anti-virus, firewall and full-disk/device encryption software) by encrypting your data without exposing it to other applications. B-Folders is so secure that it can be used with total confidence for keeping passwords, credit card info, trade secrets, etc. B-Folders provides an advanced and extraordinary synchronization technology. It allows you to keep your data consistent on multiple (more than two!) locations - desktop computers, laptops, smartphones and tablets. This consistency is achieved by performing sync sessions over USB cable, wireless (Wi-Fi, 3G) or wired network. No Web or cloud services are ever used. 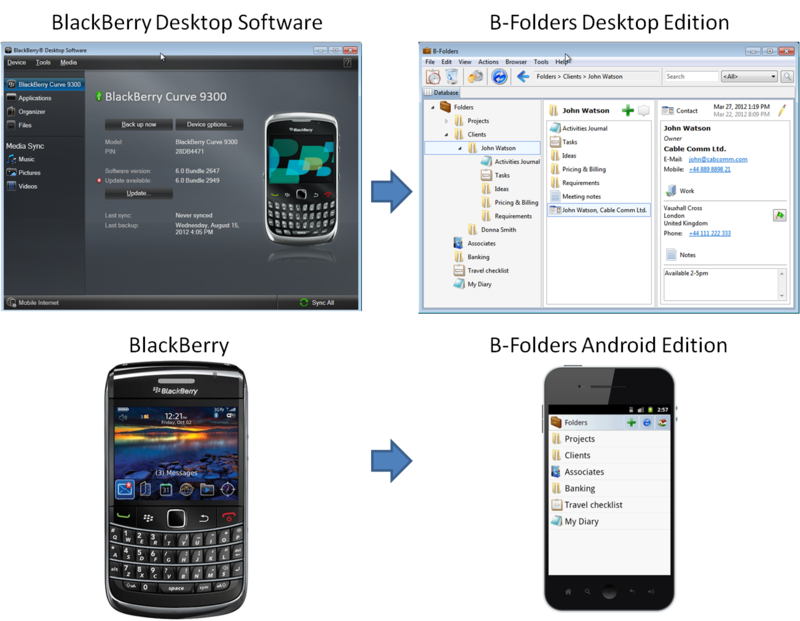 B-Folders can import MemoPad, Contacts and Tasks data directly from backup files (.bbb) created by BlackBerry Desktop Software 7.1.